This is not to compare which language sounds more beautiful or has the easiest grammar. 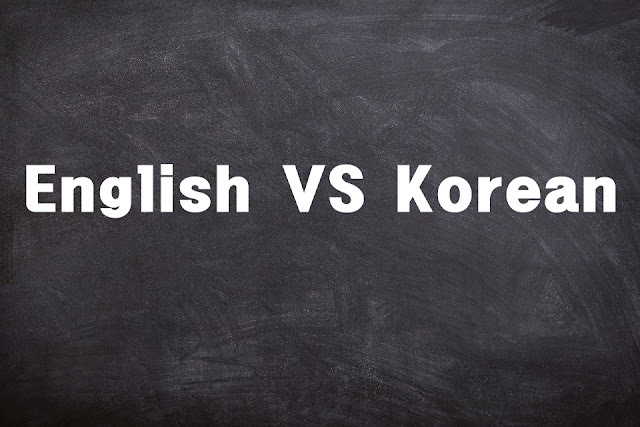 Since the only common language we speak is English, I made this note to help you understand better the difference between English and Korean. We often translate one language to another faithfully and literally and we end up sounding very unnatural. We should keep in mind that what is true to Korean may not work in English, or the other way around. So if you're ready, let me present my top ten points on the differences and similarities between English and Korean. 1. In English, once the subject (noun) is mentioned, a pronoun can be used to refer to it as the speech or conversation progresses. In Korean, it is fine to repeat it. 나는 여자를 만났다. 그 여자는 대학생이야. I met a girl. She is a college student. 2. You can use one Korean particle for a lot of English prepositions. But there is no paper on the desk. 3. When making questions in English, the word order is switched. In Korean, the position of words remains the same. All you need to do is raise your intonation. 4. The adjectives in English don’t undergo changes like verbs and nouns do. So “beautiful” is always “beautiful” (not beautifuls or beautifuled). In Korean, adjectives are (state) verbs and they transform just like verbs. Sana is a beautiful girl. 5. Sentences in English don’t end in verbs unless the object or complement is not necessary. Korean sentences always end in verb. 6. What is normally ‘my’ in English is ‘we’ in Korean as in ‘my country’, ‘my mom’, and ‘my neighborhood’. 우리 나라는 지금 어려움을 겪고 있어. My country is having a hard time these days. My mom works at the pharmacy. My neighborhood is far from Han River. 7. There are two methods to express possession in English using nouns- the apostrophe ‘s’ and of. In Korean, there is only one method and that is attaching 의 to the possessor. The hometown of Mingi is Ulsan. 8. Some verbs in English cannot be used in the progressive tense like know, believe, remember, etc. In Korean, it is possible. I am believing in God. 네가 한 말을 내가 기억하고 있어. 9. There are a few intransitive verbs in English that are transitive in Korean. Thus, the markers –을/를 are used. Examples are 걷다, 가다, and 날다. I go to school at 8. The kids are walking on the road. 10. English puts emphasis on the use of comma, but Korean does not. I want to go to Korea, but I don't have any money. 난 한국에 가고 싶은데 돈이 없어. If I am not busy, I will call you. Last month, I bought a book about puberty. 나는 지난 달에 사춘기에 대한 책을 샀어요.